Location. Location. Imagine being able to step outside and walk to the beach, walk along the Intracoastal on the Riverwalk or walk to shop or dine at Harbourside. This community is nestled between the beach and the Intracoastal and borders a 250-acre nature preserve. One thing that you won’t have to compromise on is size. High ceilings and spacious open floorplans with over 3,400 square feet under air offer plenty of room to spread out. Spacious balconies are great for entertaining and private two car garages give the feeling of a single family home. The builders have spared no expense in creating a home for even the most discriminating tastes. 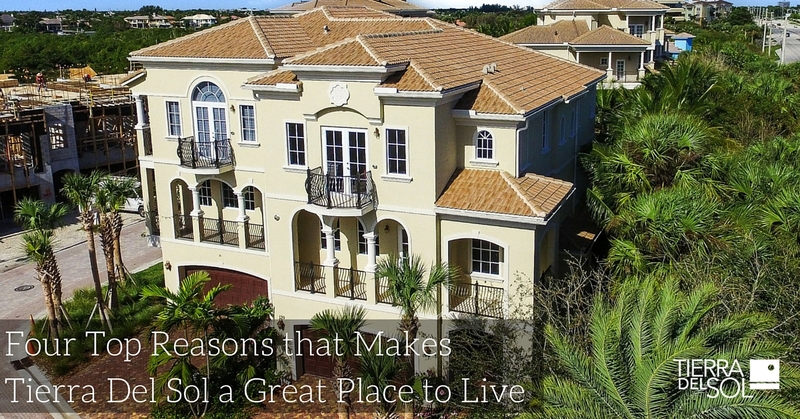 Oversized vanities, porcelain or marble flooring, lush landscaping, and coffered ceilings are just some of the many features that make Tierra Del Sol the most elegant new community in Jupiter. One of the greatest things about owning a townhome is having the flexibility to travel and enjoy life without the burdens of maintaining a single- family home. Lock the front door and fly away to the destination of your choice. The landscape will continue to be meticulously maintained, your car will be secure in this gated community inside your garage. Custom elevators and private entrances take convenience and privacy to the next level. Call us now at 561-623-3740 to schedule a tour.